Made To Order in the USA - usually ships in 5 to 7 days. 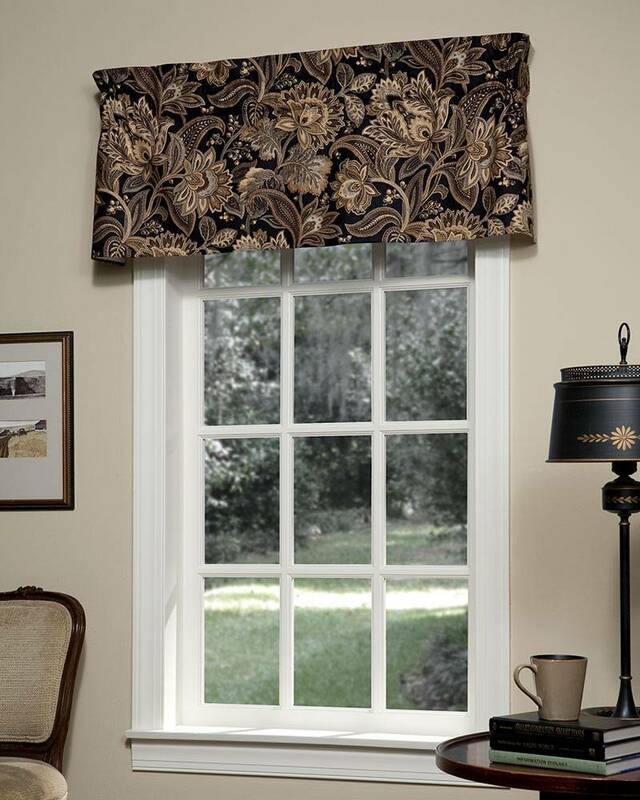 Sophisticated color and the timeless beauty of a Jacobean floral are combined in this elegant valance treatment. Printed on a soft linen and rayon fabric that drapes beautifully, Valdosta Lined Tailored Insert Valances have self piping along the bottom edge. These elegant and versatile valances will be the focal point in any room. One valance will cover windows up to 40" wide. If you like more gather, or have a wider window, simply shirr on additional valances. Valdosta Lined Tailored Insert Valances can also be combined with Valdosta Lined Tailored Swags (sold separately) to cover wider windows. (Add-in insert valances between the right and left swag panels.) Fully lined and handcrafted in the USA. A Pretty Windows exclusive.